“It’s always darkest before the dawn” may be trite, but it has great implication at this time in our human experience. Guest-writer Steve Guettermann offers some thoughts about our ability to engage immediately in rituals of reciprocity, gratitude and right-relationship with the planet, and the power of those actions to restore collective consciousness and sustainable integrity. Eric and Amanda have given a lot of provocative information lately for thought and reflection concerning the state of our planet, our country, our relationships, our human consciousness and our potential futures. It seems the world is in an accelerating free-fall. It’s hard to change direction when in free-fall. “It’s always darkest before the dawn” may be trite, but metaphorically it has great implication at this time in our human experience. While we may not be sure what is going to dawn, with things such as tanks blasting away in cultural World Heritage Sites, the question is: will we be able to see it through the dust, debris and deceit running amok throughout the planet? Can Saturn really sweep up this Pandora’s box into its rings as it moves through Capricorn? Nevertheless, dawn is on her way. There are many people doing good and great things. Several prominent thinkers claim evidence that a new branch is growing on the human evolution tree: something akin to Homo sapien universalis. What can nurture this new way of being and of becoming? Paradoxically, one answer lies in “the old ways.” This doesn’t mean the old ways of chewing hide to soften it for clothing or trading Sunday Night Football for the Aztec ball game of Tlachtli. The old ways mean understanding and engaging in heartfelt rituals of giving back to that which gives us physical life, creative potential and spiritual consciousness. They mean supplanting our obsession with living at the expense of everything and everyone else with compassionate reciprocity that engages family and friends, as well as daemonic entities of seen and unseen realms. Giving back through ceremony re-establishes and strengthens our connections with self and others, instills humility, appreciation, good humor and plentitude with that which gives us life. The very consciousness of Gaia responds to such acts and, regardless of what else we do, sacred reciprocity is paramount for sustaining our lives and assuring our evolutionary progression. It puts us on equal footing with all, rather than an unenlightened hierarchy of a chosen few being served at the expense of everything else. Giving back in the old ways of ritual assures a dynamic vitality between our physical reality and what supports us “behind the veil.” Rituals of reciprocity are vital to right relationship. They assure living within our means while constantly attracting new means that sustain us. They sustain a vibratory connection and awareness of the energies that bring matter into form — how this happens is on the forefront of quantum physics. Without such right relationship we go into free-fall. When we cut ourselves off from what sustains us we are forced to get everything from a closed system — the Earth — rather than from an open system: the Cosmos. Obsessive materiality jeopardizes the existence of every generation. Artfully acting in the old ways of right relationship is what sustains the next seven generations and beyond. It draws upon the same forces and intelligence that brought the stars into being, which brought the Star Beings into being, which brought us into being. The power of collective ritual to restore collective consciousness and sustainable integrity is something we can all do immediately. We don’t need treaties or laws. We can just do it the old way: get together with a group of friends and like-hearted people and make offerings to The Planet and the unseen realms. Superstitious? Less so than The Rapture, which we’ll look at in a bit, an idea that has not been around nearly as long as right relationship through sacred reciprocity. Some cultures and religions were and are built upon elaborate charismatic ceremonies of sacrifice and reciprocity to assure long-term survival and well-being. These ways are not so much to “gain favor with the gods,” as often perceived, but rather to maintain an intricate network of energy and creation from subtle realms to ours and back again. Western culture often fails miserably at this requirement. We might say thank you, but reciprocity is much more than gratitude. 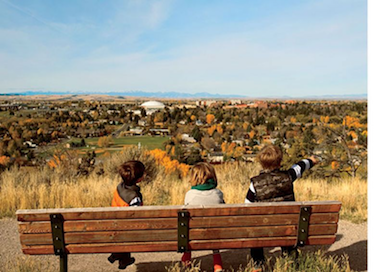 The view from Black Elk’s bench; photo by Steve Guettermann. Although there are complex rituals, sacred reciprocity can be as simple as offering food from a potluck to the spirits and energies that live in the area. Take a small amount of food, put it in a ceramic bowl in a special place in your yard or offer it up in a small fire. The “old way” of believing is that burning the food or other offering releases its spiritual essence into the finer realms where our ancestors and other helping spirits accept it. Creative gifts of love and art do wonders. Visualize a bird feeder that attracts birds. Spiritual offerings have the same type of attraction with unseen allies. In return, their spiritual guano enriches physical space and time. Our planet and lives are possible only through a tremendous configuration of cooperative simpatico forces. Just imagine the imagination it would take to create such a place as Gaia. Yet, here she is…at our feet. It is worth treading lightly upon her and leaving a little something behind as we go. Ritual reciprocity is not going to make everything peachy. It will make our challenges more sensible and put us on an upward spiral rather than going around in circles or, worse yet, that free-fall. In other words, heartfelt acts of connecting to the Planet can help change the direction and consciousness of humankind. I have contemplated that quote for years; or, more to the point, wondered, “What the hell does that mean?” I could see where any place on the good road could be holy, but not the road of difficulties, which I attributed to my human failings. Thus, how was the nexus made holy? It made no sense. It was a point of collision and confusion, not sanctity. It seemed to be one of those things Lakota elders like to say to drive the rest of us nuts…an indigenous Zen koan. Part of my quandary came from my struggles on the road of difficulties. I have come to accept I need both the good road and the road of difficulties to figure some things out. Where they cross is a point of reflection. This is new to me. But I missed something else. I thought the good road was the cosmic easy street. It’s not. The good road is the Road of Difficulty, while the other is the Road of Difficulties. Both are very hard, but for different reasons. The good road is difficult because it requires doing the right thing, if we can even figure out what that is. And that road gets harder the longer we are on it, for we realize what was good enough yesterday is not good enough today. This is conscious evolution and leads to Homo sapien universalis. 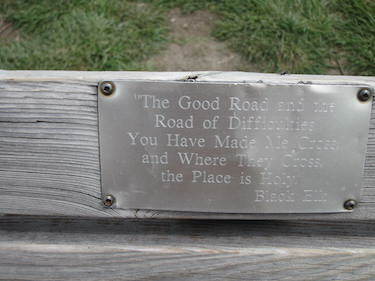 “The Good Road and the Road of Difficulties You Have Made Me Cross; and Where They Cross, the Place is Holy” — Black Elk; photo of Black Elk’s bench by Steve Guettermann. The Road of Difficulties seems to get harder the longer we are on it, too. The current state of our planet supports this. What’s the difference between the two? The Road of Difficulty is what life is supposed to be; the Road of Difficulties is what life does not have to be. Despite what we may think, just because things have a reason for being does not mean they have to be that way. Nor do we have to hit bottom before we change direction. We can change now; many people are. Acts of sacred reciprocity provide the essence necessary for right relationship, the impetus for conscious evolution, a compass into mystery rather than morass. Such an act can begin with something as simple as hugging your child or hugging a tree with your child. There is a growing body of scientific evidence that shows how simple things like this can help. However, according to a 2010 Pew Research Center report, 41% of Americans believe The Rapture will occur by 2050. This means 41% of Americans believe God will take care of our problems, thus there is no need for us to act upon them. Should this planet go, God will just whip up another in six days. This is a major reason why there is no semblance of kinship between many Americans and the Planet and what goes on here. This is another form of disembodiment. A better way to experience rapture is to engage in right relationship, rather than relinquishing the joys and responsibilities of what it means to be human. We have no idea what we are on the verge of becoming by giving back just a little bit. A push-button world that disconnects us from what gives us life does little to enhance the quality of life, if it does nothing to enhance the quality of consciousness and connection with what gives us life. Steve Guettermann is a freelance writer and “teaches” critical thinking at Montana State University. 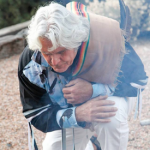 He is currently studying Peruvian shamanism under don Oscar Miro-Quesada, and published an article in last year’s Planet Waves annual edition, Vision Quest. Steve’s email is migratoryanimal@gmail.com; you can also visit his website. The Art of Becoming, the 2018 Planet Waves Annual by Eric Francis, will be your best guide to the major astrological shifts ahead. If you pre-order now, you’ll not only get all 12 signs of the written reading for $99, but we’ll include three extra videos covering the forthcoming sign changes of Saturn, Chiron and Uranus. The Ancients call us the Homoluminous. Travelling from Star to Star. Nourishing ourselves from experiences that GROW CORN for us. Thank you, Steve. This is sage advice, and is deeply appreciated. Since the eclipse, (and because of it), I’ve become a Humanist Celebrant, a Reiki practitioner, and have developed a special closeness with the tree off the balcony and a squirrel that holds his belly when he wants me to give him his daily sunflower seeds. 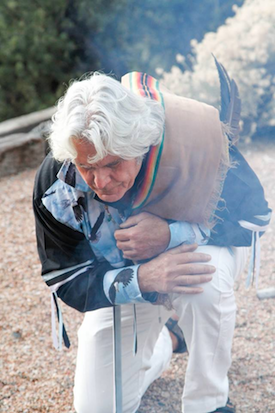 A grounding morning ritual with nature is quite stimulating as you can feel the universal chi vibrating out, connecting us all. Thank you for your thoughts, I’m feeling them.